HomeLiterature and BooksLiterature By Time PeriodWorld & Early US History 1600-1800Can't You Make Them Behave, King George? This entertaining volume sheds light on the life of England's King George III. 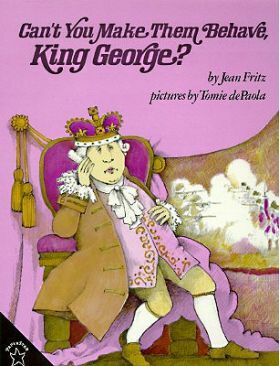 It begins when he was a bashful boy who blushed easily, goes on to his early days as king, and finally examines his role in the American Revolution - when Americans ceased to think of him as good King George. Fascinating history made accessible for young readers. Can't You Make Them Behave, King George? is recommended reading in the following home school programs: Sonlight Curriculum. All King George III ever wanted was for everyone to be as conscientious as he was about obeying the rules! After all, he followed the rules for being a good king, so why were those pesky Americans causing so much trouble?